What is she doing? Is she 'squashing' the snow with her hand? Is it the correct verb? 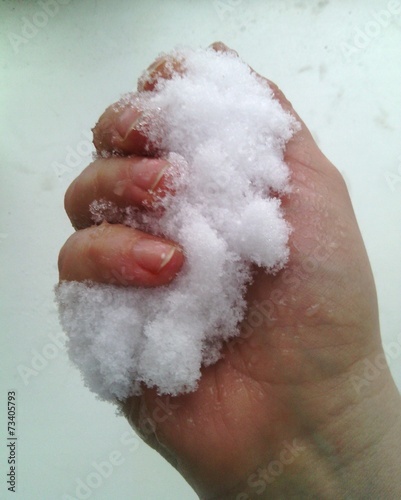 I've never heard squashing or squeezing when applied to snow in your hand. We pack snowballs, for example. In this case, I might say "compressing" – "compacting" doesn't seem quite right for some reason. I would say that "squeeze" is the better word for that picture. When I think of "squash", I think if pressing something flat, or mashing it into a pulp. Could just be me, though. I agree that "squash" implies that you intend to make it as flat (or possibly as small) as possible. You can squeeze something a little bit. You can squeeze something gently. Squash is generally complete and forceful. I, too, agree with "squeeze" between the two words squeeze and squash.